People create a heart shaped with candles as a tribute to slain mayor of Gdansk Pawel Adamowicz in Gdansk, Poland, Jan. 16, 2019. Poles on Wednesday heatedly condemned the power of hate speech to trigger real-life violence after the slaying of a popular liberal mayor, with many calling for stronger actions against those who threaten others. Not only did the killer, an ex-convict, take the life of the 53-year-old Gdansk mayor, Pawel Adamowicz, but he stabbed him during a popular fundraising concert by the Great Orchestra of Christmas Charity, which raises money for life-saving medical equipment. Both the mayor and the organization are prominent symbols of openness and tolerance, leaving many Poles to interpret the attack as a double blow to those values. Investigators are checking to see if the assailant, who was recently released from prison, has psychiatric problems. He stabbed Adamowicz three times in the heart and abdomen and told the crowd Sunday evening that it was revenge against Civic Platform, the now-opposition party that was in power when he was imprisoned for bank robberies. The brutal killing took place as Poland is more bitterly divided than at any time since it threw off communism 30 years ago, with massive amounts of hate speech and even death threats against prominent figures. 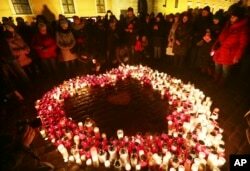 People stand by a heart shaped with candles as a tribute to slain mayor of Gdansk Pawel Adamowicz at the Square in the Old Town, Warsaw, Poland, Jan. 16, 2019. ​Other city mayors who, like Adamowicz, have also received death threats appealed Wednesday to justice officials to more effectively prosecute such activity. Adamowicz was a longtime member of the Civic Platform party but left it in 2015. He died on Monday, leaving behind a wife and two daughters, aged 8 and 15. “Hatred killed Pawel. A hatred that was insane, a hatred that was well-organized,'' Grzegorz Schetyna, the head of the Civic Platform, said Wednesday during a session of parliament that began with a moment of silence and prayers for Adamowicz. The charity that Adamowicz supported is Poland's largest nonprofit organization and has become a model of civic engagement and humanitarianism in its 27 years. Founder Jerzy Owsiak is also a prominent liberal voice who has sparred verbally with members of the country's right-wing ruling party, Law and Justice. Just last week, state television, TVP, which is government controlled, ran an animation that depicted Owsiak in a defamatory manner. The broadcaster apologized after an outcry, while the head of the news program has been indefinitely suspended. In the wake of Adamowicz's death, Owsiak resigned from his position, citing police inaction despite threats against him. Wednesday evening, a crowd gathered outside TVP's main editorial office in Warsaw in protest following a Monday evening report on Adamowicz's death that seemed to put all blame for all the aggression in the country solely on Civic Platform officials. Meanwhile, pressure mounted on the ruling party to fire the head of TVP. In its main evening news report, TVP said its staff was also being targeted by hate speech and threats. Adamowicz was also an object of hate for far-right extremists for his support for migrants and gay rights. In 2017, after he voiced support for bringing wounded Syrian children for medical treatment in Gdansk, the far-right group All-Polish Youth issued a symbolic “political death notice'' for him and several other liberal leaders. Prosecutors had dropped that investigation. On Wednesday, Adam Bodnar, an independent state official for human rights, said he was sending a request to the prosecutor general to reopen a list of frozen hate crime cases. Since Adamowicz's killing, police in Poland have arrested several suspects threatening to kill public figures, including Donald Tusk, the former Polish prime minister who is now president of the European Council. On Wednesday evening in Gdansk, Adamowicz's wife, Magdalena Adamowicz, and elder daughter, Antonina, joined thousands of mourners who formed a large heart with candles. They thanked the people of the city for their support. The widow also urged people to be good to each other, saying her husband loved everyone. “I love you, daddy, very much and forever,'' his tearful daughter said in the family's first public appearance since the killing. “I love you, Pawel,'' his wife said while embracing her daughter. Gdansk officials said Adamowicz's funeral Mass would take place at noon Saturday and that he would be buried in St. Mary's Basilica, a Gothic brick church where other prominent city figures were laid to rest. 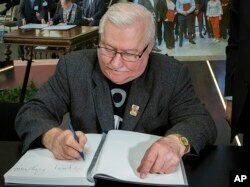 Among those signing a condolence book was ex-president Lech Walesa, a democracy leader who founded the anti-communist Solidarity movement in Gdansk shipyard in 1980 and later won the Nobel Peace prize.